This Craftsman exterior has a hint of rustic influence with stone-and-shake cladding and a prominent shed dormer. A courtyard entry garage provides a personal door and extra storage. Columns keep the living areas open, defining the foyer, dining room, and great room. The kitchen features counter seating serving both the breakfast room and great room while the screened porch invites sunshine and warmth with three skylights. A mud room with coat closet and bench seat awaits at the garage entrance, followed by a walk-in pantry. The utility room has additional storage, a sink and a view to the rear. 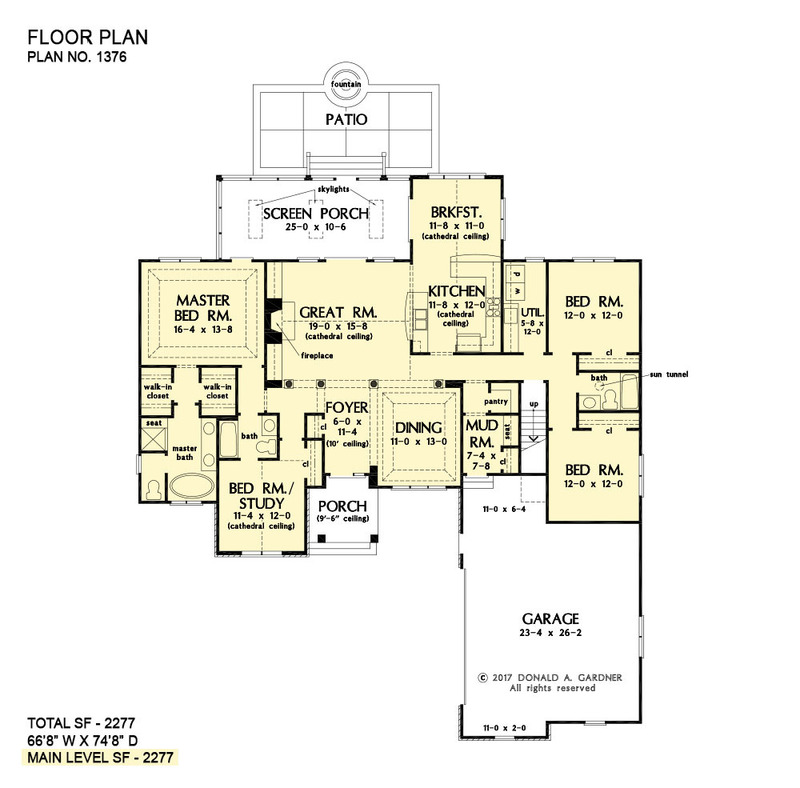 A study/bedroom with full bathroom, two secondary bedrooms, and spacious master suite and flexible bonus room complete the plan. 1st Floor: 2277 Sq. Ft. 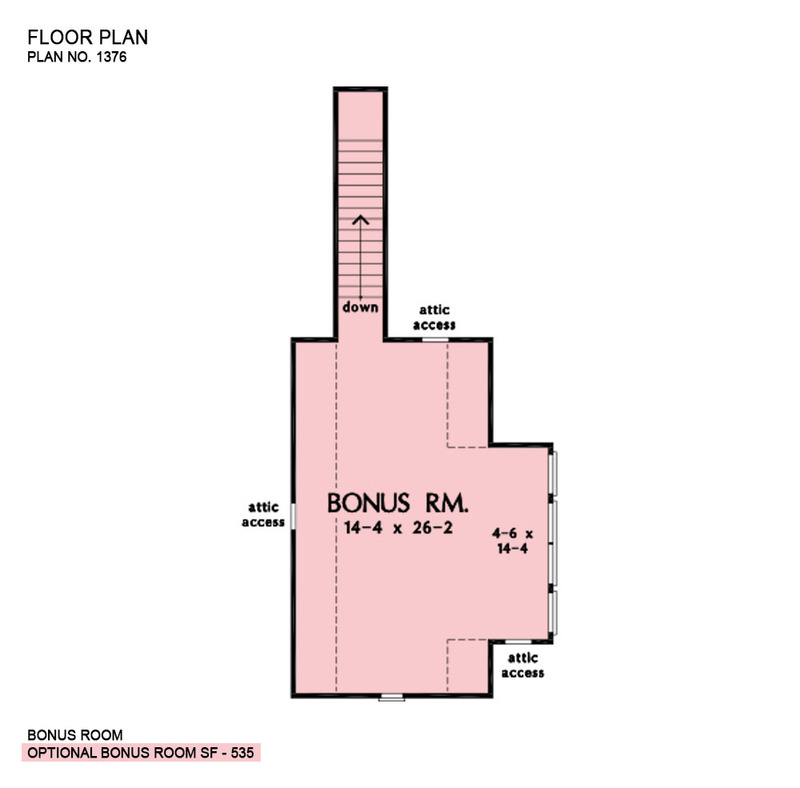 Bonus Room: 535 Sq. Ft.
Porch - Front: 77 Sq. Ft.
Porch - Screened: 287 Sq. 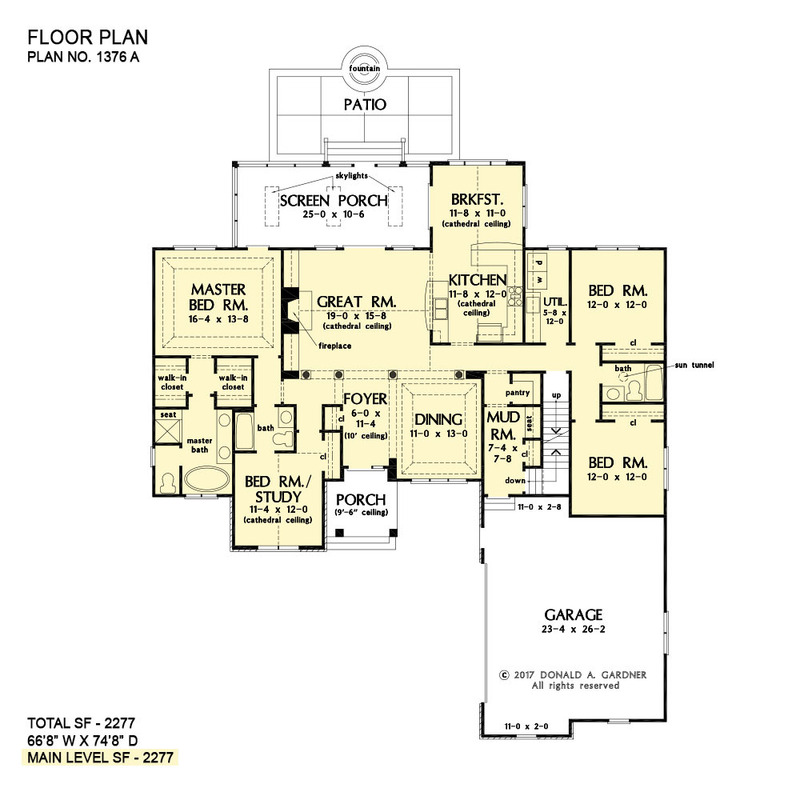 Ft.
House Dimensions: 66' 8" x 74' 8"
Breakfast Room (Cathedral): 11' 8" x 11' 0" x 13' 0"
Mud Room (Flat): 7' 4" x 7' 8" x 9' 0"
Foyer (Flat): 6' 0" x 11' 4" x 10' 0"
Great Room (Cathedral): 19' 0" x 15' 8" x 14' 4"
Kitchen (Cathedral): 11' 8" x 12' 0" x 13' 0"
Bonus Room (Clipped): 14' 4" x 26' 2" x 8' 0"
Garage (Flat): 23' 4" x 26' 2" x 0' 0"
Bedroom / Study (Cathedral): 11' 4" x 12' 0" x 13' 0"
Porch - Front (Flat): 9' 5" x 7' 2" x 9' 6"
Deck / Patio (None): 24' 8" x 12' 0" x 0' 0"
Porch - Screen (Flat): 25' 0" x 10' 6" x 9' 0"